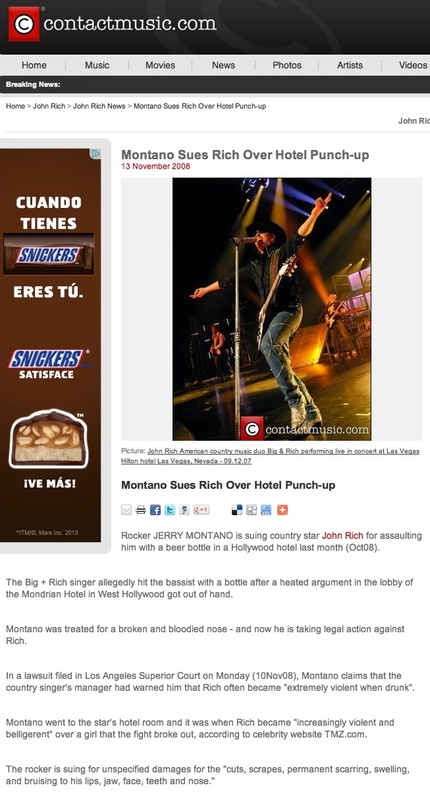 Rocker JERRY MONTANO is suing country star JOHN RICH for assaulting him with a beer bottle in a Hollywood hotel last month (Oct08). The Big + Rich singer allegedly hit the bassist with a bottle after a heated argument in the lobby of the Mondrian Hotel in West Hollywood got out of hand. Montano was treated for a broken and bloodied nose - and now he is taking legal action against Rich. In a lawsuit filed in Los Angeles Superior Court on Monday (10Nov08), Montano claims that the country singer's manager had warned him that Rich often became "extremely violent when drunk". Montano went to the star's hotel room and it was when Rich became "increasingly violent and belligerent" over a girl that the fight broke out, according to celebrity website TMZ.com. The rocker is suing for unspecified damages for the "cuts, scrapes, permanent scarring, swelling, and bruising to his lips, jaw, face, teeth and nose."